Form No. 1-100 - 17.11.11. Sent date 15 APRIL 1912. No. OLYMPIC, Office of Origin OLYMPIC. 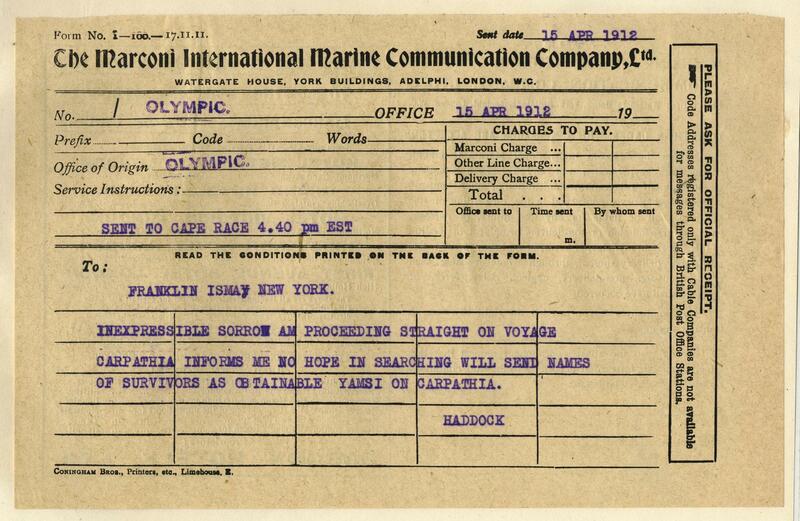 Service Instructions : SENT TO CAPE RACE 4.40 pm EST. To : FRANKLIN ISMAY NEW YORK. INEXPRESSIBLE SORROW AM PROCEEDING STRAIGHT ON VOYAGE CARPATHIA INFORMS ME NO HOPE IN SEARCHING WILL SEND NAMES OF SURVIVORS AS OBTAINABLE YAMSI ON CARPATHIA. HADDOCK.